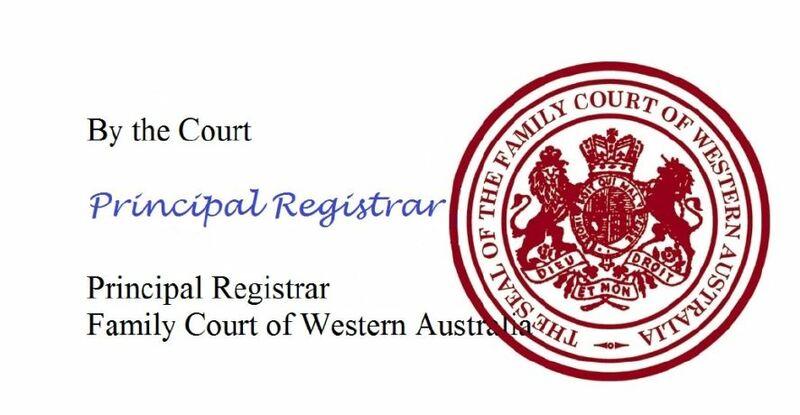 From 1 October 2018 the Family Court of Western Australia stopped posting Court Orders to clients and lawyers. Court Orders are now only signed and sealed electronically and available for clients to download from the Commonwealth Courts Portal - www.comcourts.gov.au/. Link to their file(s) and opt-in for email notifications when key events occur on their portal file(s). Clients and lawyers will have 24/7 access to their portal file(s). Please note that court orders dated prior to 1 July 2017 are not available on the Commonwealth Courts Portal. Orders before 1 July 2017 need to be requested from the Court using the Request for Court Documents form (see download below). Official Court orders should be printed in colour so that the Court seal is red and the signature is blue. If you don’t print your order in colour, it may be deemed a copy by any agency or person you present the order to. When will my order be available on the Commonwealth Courts Portal? You will need to allow up to 4 weeks (approximately) before your orders are available on the Portal. Once available, you will receive an email notification that the orders are ready to be downloaded from the Commonwealth Courts Portal. Urgent Orders are extracted the same day as the hearing and can be collected from the Registry on the day. Prompt Orders are extracted in a 2 working day turnaround. Once available you will receive an email notification that the orders are ready to be downloaded from the Commonwealth Courts Portal. If you are experiencing troubles viewing or opening your order on the Commonwealth Courts portal, send an email to Family.Court@justice.wa.gov.au advising of the problem including your PTW file number and the details of the orders you are having trouble with. Alternatively, you can telephone the Call Centre on 08 9224 8222 or 1800 199 228 to report the problem. If you have decided to end your relationship, you should start to educate yourself. I know the overwhelming feelings of making these decisions and facing your new realities. My book, The First Steps through Separation and Divorce will guide you through the emotional and practical aspects you may need to address in the coming weeks, months and years. Get a feel for what's covered: View the Table of Contents.